SiteBar can be integrated to many browsers and even some 3rd party software. See screenshots with various examples of SiteBar usage in Firefox and Internet Explorer. See also instructions for recommended way of using SiteBar with Firefox and SiteBar with Internet Explorer. 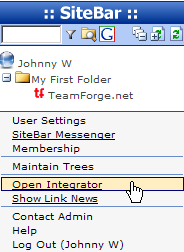 Click on the item Open Integrator in the User menu. A SiteBar Integrator will be shown, displaying information of how to integrate and use SiteBar.